Every garden path comes with a question: Where does it lead? But it’s the journey as well as the destination that makes it so alluring. Along the way, the garden slowly reveals surprises – choice plants appear, scents envelop you, vistas open up, and flowers present themselves for cutting. Paths may be designed to slow people down. “Traveling through is as important as the point of arrival,” says its creator, landscape architect Michael Buccino. So it is with most well-thought-out paths. They set the pace – at one moment leading you to a tree with beautifully flaking bark, and at another presenting you with a striking vista or a piece of evocative garden art. Such pauses are planned: a widening here, a cluster of tiny sculptural succulents there, or a bench that beckons from across the garden. The splash of a fountain may draw you down a small side path, just as the action around a feeder might invite you to watch the birds for a moment. A good path leads with authority through the garden. That’s why designers route them in ways that direct your gaze toward beautiful things and away from unlovely necessities like compost piles and trash cans. Broad, well-marked entries pull you in, while trails that wander off behind the shrubbery are often intentionally hiding something. There’s also much to be said for putting paths where they want to be – wherever family members have worn trails into the turf, for instance. 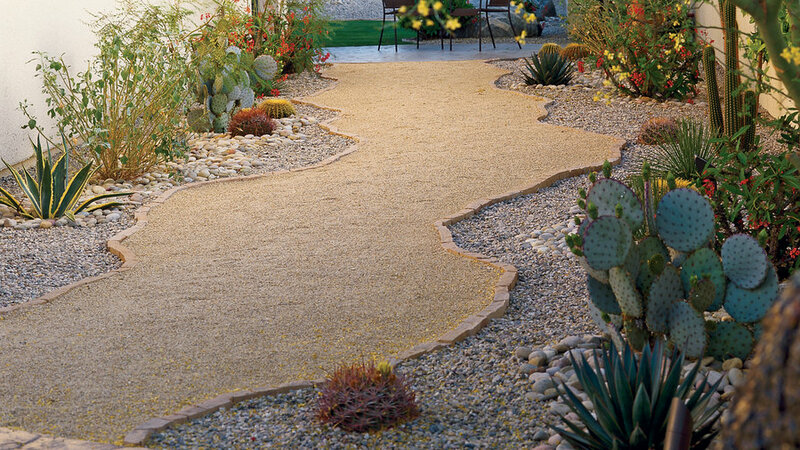 Use solid materials such as brick and flagstone for paths you’re likely to travel on barefoot, and bark or gravel for natural-looking satellite paths (edge loose surfaces with rocks or benderboard). To soften a path’s look, plant low groundcovers between pavers. Allow at least 2 inches of soil between pavers, then amend the soil well – it should be light so it won’t pack down with foot traffic – before planting. Once your paths are in place, accessorize the areas around them with art, a bench, or an arbor. That way, each area becomes a mini destination, and all combine to make the journey a delight. Start by mapping your garden on graph paper. Put an X at every key location: the hammock, the honeysuckle arbor, the garden’s best view, a bench that gets morning sun. Mark the garden’s access points (gates, doors, patio) and its infrastructure (compost pile, hose bibs, heat pump, toolshed). A path system should connect all these points. Make paths wider than you think necessary – you’ll appreciate the extra space when you’re brushing past thorny or rain-soaked shrubs. Wide paths also allow room for groundcovers to soften their edges without crowding you. Make major paths 6 feet wide so two people can walk abreast, and never less than 4 feet wide. Spur paths can be 2 feet wide if you’ll never need to access them with rolling garden equipment. Main pathways need a hard or hard-packed surface that can easily support wheelbarrows, garden carts, and lawn mowers. If you’re using gravel, get the sharp-edged kind; round-edged pea gravel doesn’t pack well, so wheels sink in. In cold climates, avoid smooth surfaces like glazed tiles and finished wood; such surfaces can be damaged by sand used to cover ice buildup. Crown hard-surfaced paths (¼-in. drop per foot) so water runs off. Honey-scented white flowers cover this annual all year in mild climates, or from spring through frost where it’s cold. Scatter seed in cracks or gravel, and bloom will appear a few weeks later. There are lavender-pink and deep violet-purple forms. This drought-tolerant, fragrant, crevice-loving plant with blue-green foliage is a classic for paths. Growing 3 inches tall and rooting as it spreads, it takes light foot traffic and blooms all summer (bees could spell trouble if you plan to run the pathway barefoot). It grows everywhere except Hawaii. This dense 3-inch-tall, evergreen groundcover seems made for cracks. Blue star-shaped flowers cover it in spring and early summer. It grows everywhere except cold-winter climates and desert; in warm parts of California, it needs abundant summer water to avoid burnout.